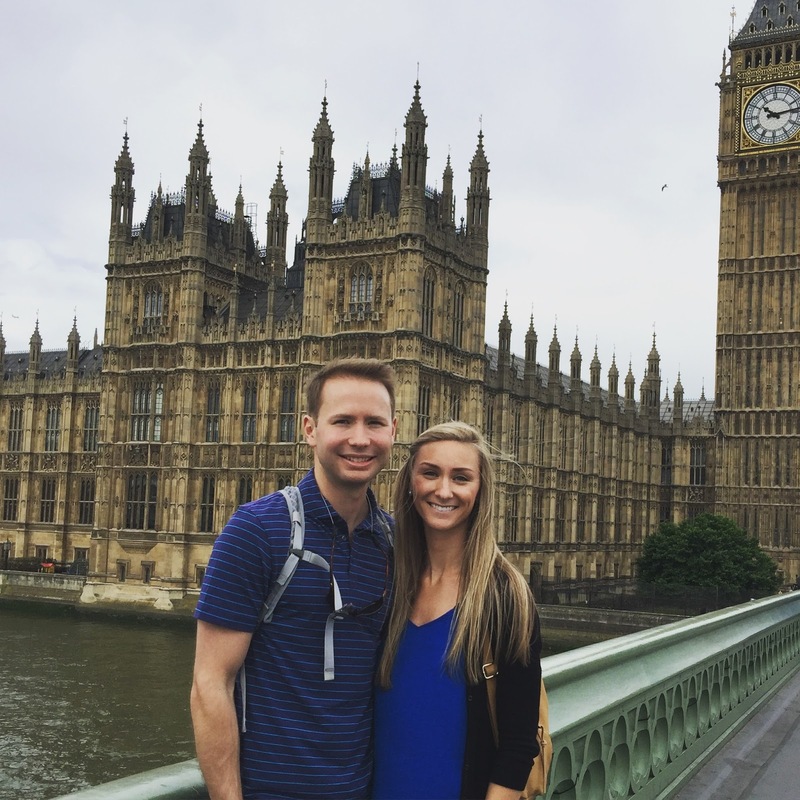 For John and my fourth wedding anniversary, we packed our bags (in the form of a single backpack) and headed across the pond for a European adventure! We started in London, headed to Paris and Rome, then finished our trip back in London before flying back to the motherland. 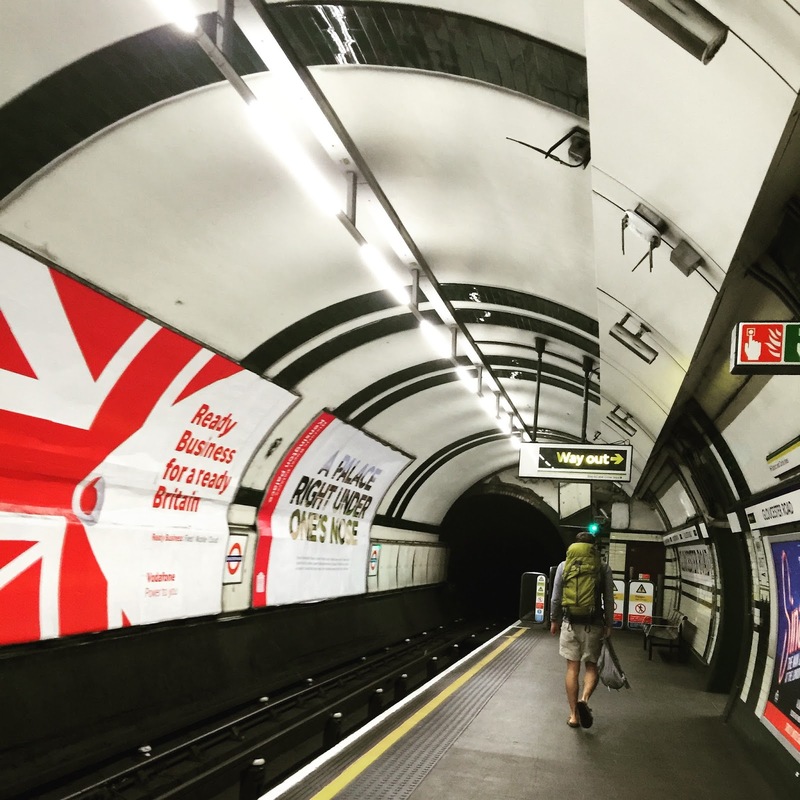 We arrived in London late Wednesday night, and took the London Underground (i.e. the tube) from the airport to our hotel. Throughout our time in London we took the tube everywhere, and we were pleasantly surprised by how easy it was to navigate. The next morning we woke up bright and early (...like, really bright and early for me - jet lag and excitement had me up at 3:30AM and unable to go back to bed!) and did a hop-on-hop-off bus tour of London. There were different routes for the buses, and we were able to pick which ones we wanted to go on depending the different sites that we wanted to see. It was a great way to cover a lot of ground in a short amount of time. Of course, we took many pictures in front of the Palace of Westminster and Big Ben (although Big Ben is technically the bell within the bell tower...). The architecture was absolutely beautiful, and really unlike anything I had seen before. We also went in and toured Westminster Abbey. As with most churches in Europe, pictures were not allowed inside the Abbey. John really enjoyed the tour, but honestly, I thought the whole thing was a little dusty and cluttered (I know, people probably think I am crazy for saying that!). By midday we were pretty tired, so we decided to take a river boat cruise down the Thames. If you ask John, the weather was absolutely perfect, but if you ask me, it was even a little bit chilly! I guess that's what happens when you're coming from 110 degrees - it makes 75 seem a bit nippy! 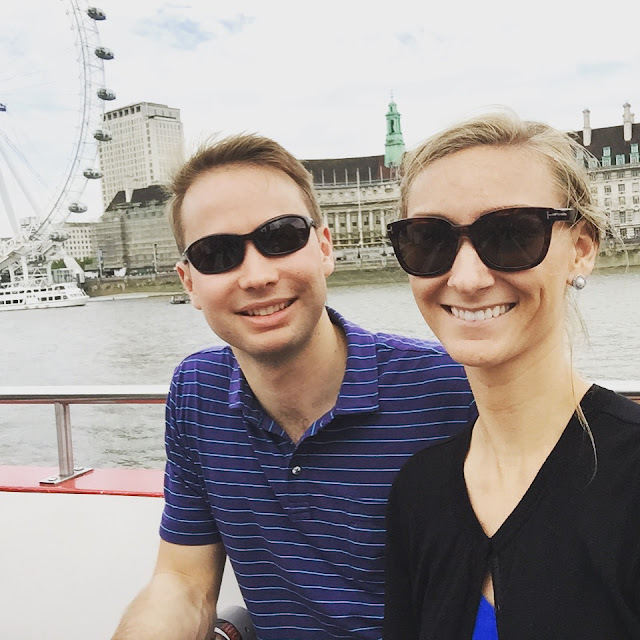 After our river cruise, we headed back to the hop-on-hop-off bus tour to check out St. Paul's Cathedral. It's one of the highest points in the city of London, and makes for a great street view when looking out. The day started out pretty overcast, but soon enough the sun was shining and the skies were bright blue! Buckingham Palace was a must-stop for me (obvi), and before getting there, we enjoyed walking around St. James Park (which is one of the eight royal parks owned by the Queen). Okay, so, maybe it was the jet lag, but I was a little bit underwhelmed with Buckingham Palace. We didn't tour inside (we opted for Tower of London and the crown jewels instead), but the outside seemed a little bleak. I mean, obviously it was beautiful... after all it's one of the homes of the Queen, but still, I was much more wow-ed by the exterior of the Palace of Versailles and Luxembourg Palace in Paris. Before we left for our trip, we knew that we wanted to eat good, local food, but that we did not want to spend a million bucks doing it. 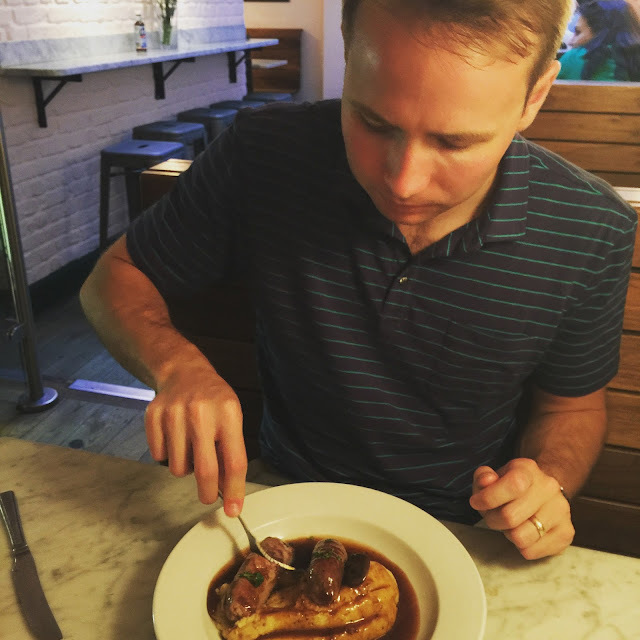 To maximize our delicious (and relatively inexpensive) eating options, John and I did quite a bit of research on different places to eat. When he discovered Mother Mash, to say he was pretty excited to try out would be an understatement. Basically, they serve different combinations of sausage, potatoes, and gravy... the man loved it! I was really advocating for Bubbledogs, which serves champagne and gourmet hotdogs, but John would have nothing of it, haha! 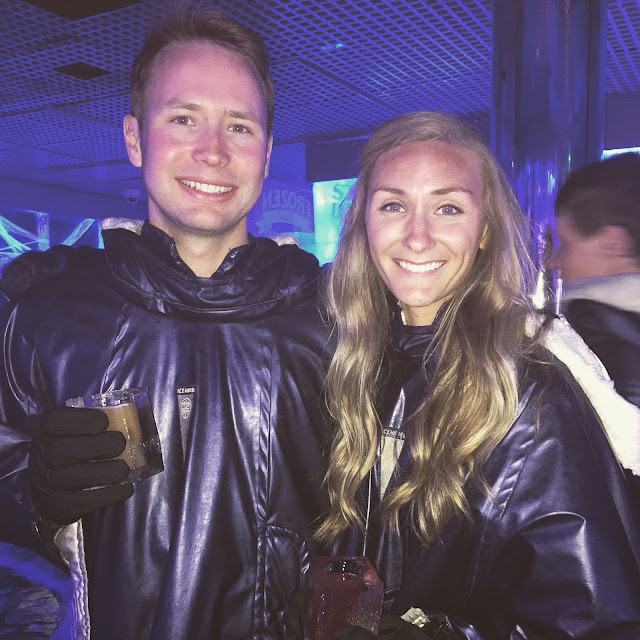 After dinner, we headed to Icebar London... John basically hates that this happened (but secretly, I know that he loved it!). As the name states, everything (including the glasses you drink from and the tables) are made out of ice. We basically drank our drink and jetted, but it was still a fun little night cap! To close the night, we walked around Piccadilly Circus, which is basically the Times Square of London. It was a beautiful night, and the perfect end to a first day in London. Our second day in London started with touring the Tower of London and seeing the crown jewels. We started exploring with a mini tour before we got in line to see the crown jewels. The Tower of London was easily one of John's favorite stops in London, and had we had more time, you could honestly spend a full day here going through everything (well, John could, at least - he was like a little kid looking at all of the suits of armor and cannons!). That evening (after an obligatory stop for fish and chips at a pub), we headed to The Phantom of the Opera. Honestly, this was one of the trip highlights for me... it was absolutely amazing!! The show was at Her Majesty's Theater, which is the location for the original composure. The talent was incredible, and the whole show was really well done. I enjoyed the show so much that the next time we are in London, I would honestly consider seeing it again! In reality, I would probably opt for something I haven't seen, but it really was so great that I wouldn't mind seeing it more than once. 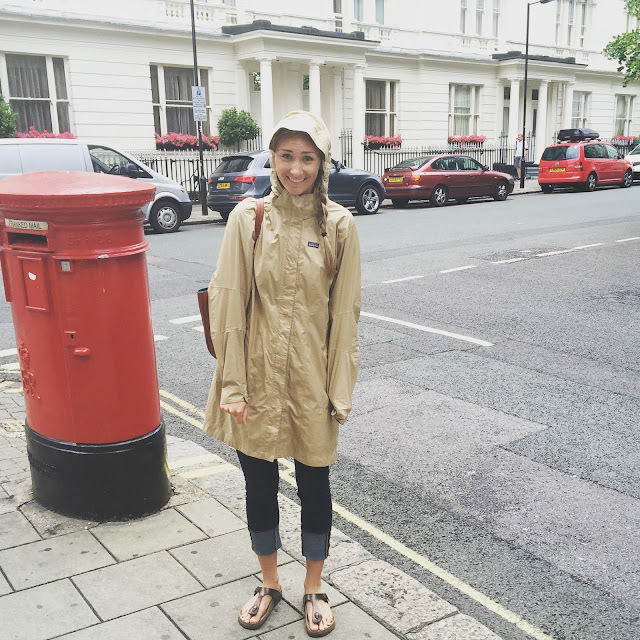 Our last day in London consisted of a bit of morning rain... and honestly, it seemed super fitting. 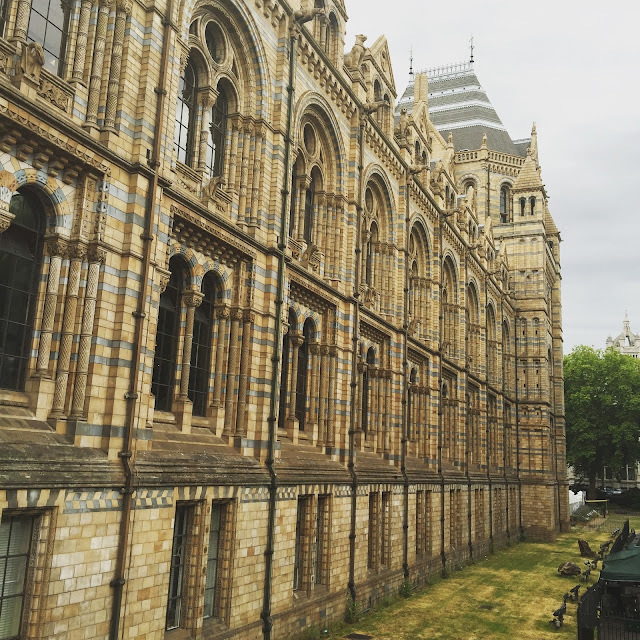 On our last day in London, both John and I wanted to go to the Natural History Museum. If we had more time in London, this is once of the stops that we would have definitely expanded - it's huge and there is so much (beyond the dinosaurs) to see! And who doesn't love dinosaurs?! 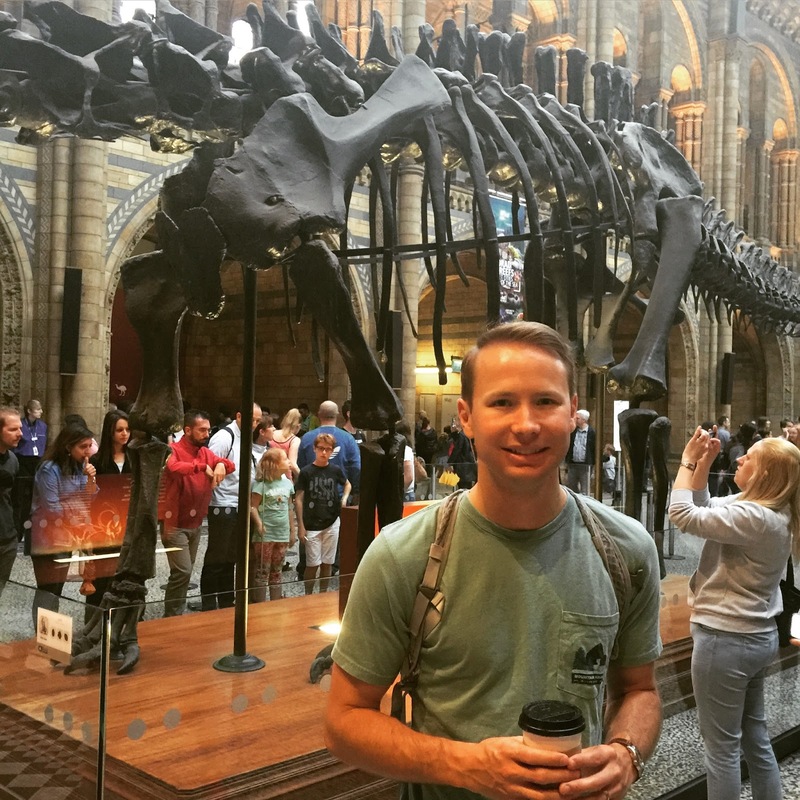 The museum has the very first T. Rex fossil ever found and many other massively large mammals! Our last London selfie before leaving! Let me tell you, the backpacks were absolutely genius. Since we took public transportation everywhere, the backpacks made it so much easier to run around and cram into a jam packed tube... and honestly, I don't feel like I sacrificed much in terms of packing either! 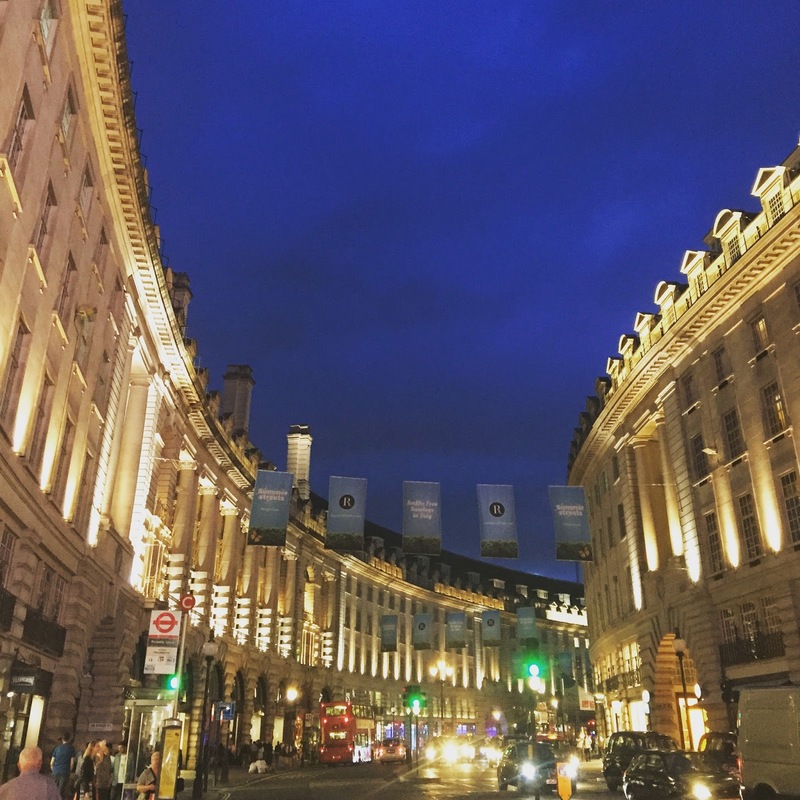 I absolutely loved London, and honestly, of the three cities we visited (London, Paris, and Rome), London seems the most likely that we will re-visit - it was the perfect place to start and end our trip. 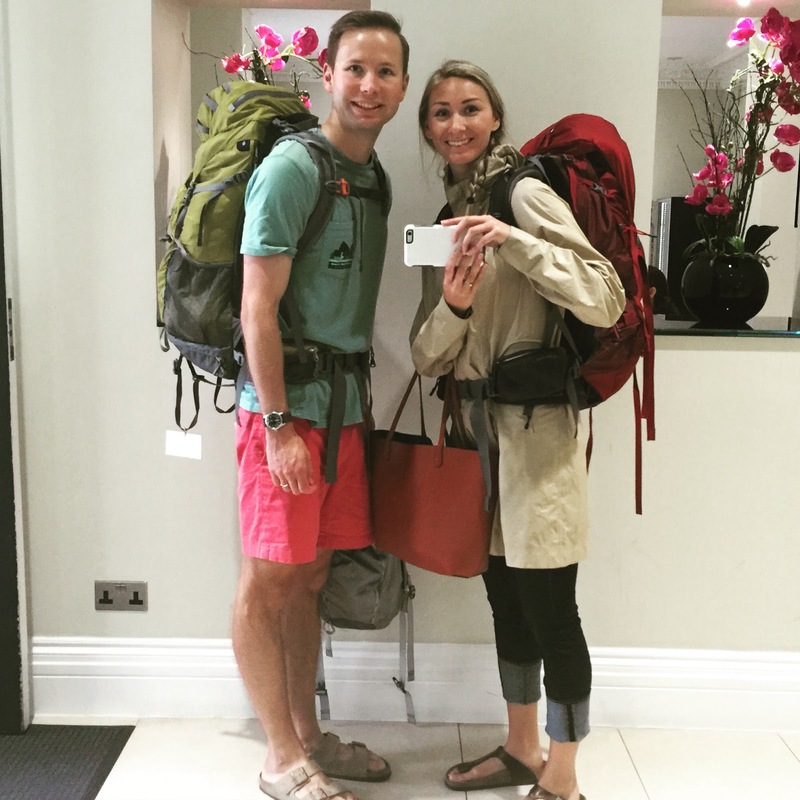 Our time was short, but we crammed a lot in... next up: Paris and Rome! London is my favorite city in the world! Glad you guys had such an amazing time. Now I cant wait to go back haha! And up until that last picture of you in the rain I was going to say you guys had amazing weather. Ive never been when it didnt rain at least a few days! Wow! That sounds amazing. Glad you had such a great time. What a beautiful place. Love love love that second picture of the Big Ben tower!! Amazing!! It sounds like you all did SO MUCH - I love it!!! 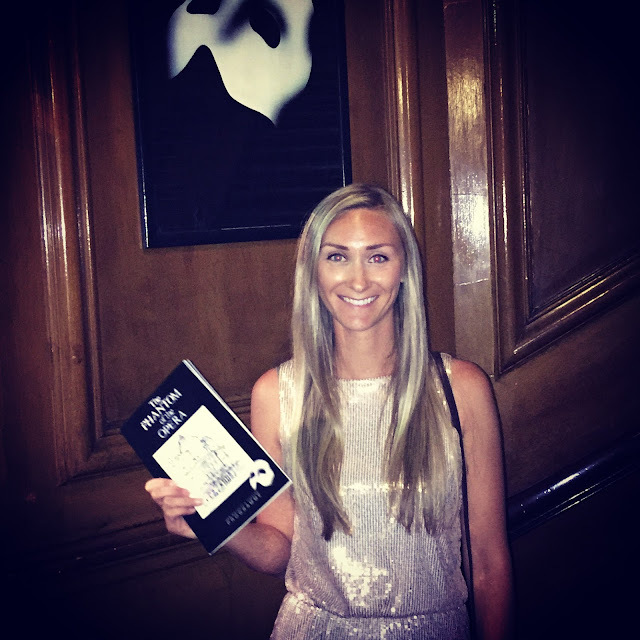 Phantom in London is totally the best cast I've seen.... and I've seen it A LOT... :-X. Can't wait to hear more about your adventures!! I am SO jealous! Looks like an amazing time! Wowwww amazing pictures! The icebar seems like such a fun place, I can't believe he didn't like it! I am so jealous, London is definitely on my bucket list. Wow, y'all know how to fit a lot into one trip! I'm impressed by that and your packing skills. Not sure I could ever fit what I want into a backpack for a trip overseas! Gorgeous photos! I'm dying to go to London. All my friends who have been there say it's their top 5 places to visit. Looks like you all had a great time. I've enjoyed following along on instagram! What a fun anniversary trip! Trip of a lifetime!!! 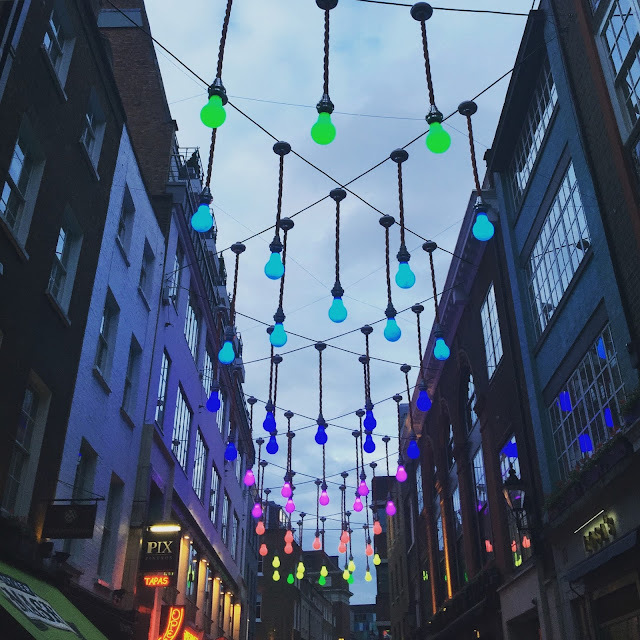 I loved following along on Instagram - looks like you guys had the most amazing time! And now I'm craving fish and chips! I am so impressed that you guys were able to pack everything in your backpacks and still look great! It looks like you guys packed so much in and had the best time! We've been talking about going over next summer for our second anniversary so I'm loving looking at your photos - can't wait for the rest of the trip! Bubbledogs sounds awesome haha. Piccadilly Circus looks beautiful! You got some great shots! So so fun!! It looks like yall had a blast! Also random but where are your sunglasses from?? I love them! Looks amazing, Lisa! So glad you guys had a blast! What a lovely place. I really want to see it someday. Love London! And it looks like you guys had amazing weather (besides the morning rain) too. It was overcast the entire time I was there! All the heart eyes for this post!! I LOVE London and all of your pictures are beautiful. Can't wait to hear about your next stop! You saw so much! I would love love love to visit London. There is so much I would love to see there! I can't believe you only backed one backpack for that whole trip. Amazing. So so fun! So glad you got to celebrate your 4th anniversary in such a big way! 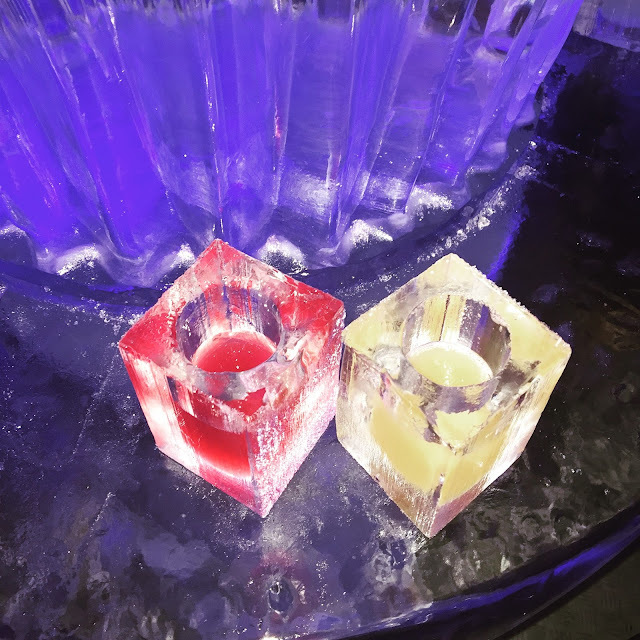 The ice bar looks so cool! I completely agree with going from 100+ temps to 75. I'd be freezing! I've been to Paris and Rome and loved them both. Now you have me dying to try London! Gorgeous pictures! I loved following your trip via IG - looks like you two had a blast!